Season seven of the original series ended with Luke and Lorelai making out and we assumed getting back together, and eight years later they are still together – not married, no kids – but still together. And despite the few curveballs that they throw at us, Luke and Lorelai seem happy through most of A Year in the Life. A big problem that they seem to be facing is miscommunication or lack of communication, firstly Lorelai starts to worry whether Luke wants a child, and they consider surrogacy (with an excellent appearance of Paris), and then Richard leaves Luke money to franchise Luke’s Diner and he considers doing it because he thinks it will make Lorelai happy. After Lorelai’s Wild trip, Luke fears that she is breaking up with him and he pours his heart out to her telling her not to leave him, and she responds by saying that that she wants to get married. It’s the most honest and forthcoming that they have ever been with each other, and this more than the wedding was evidence to me that they were going to be okay. It shows growth between the two of them (because let’s be real, Lorelai was not the best at relationships) and growth in their relationship. The series culminated in their wedding at the end, Luke and Lorelai didn’t want the pressure of the actual day so they secretly got married the night before, in a beautifully decorated town square (done by none other that Kirk himself). The montage of this scene was beautiful, and it was great to see Luke and Lorelai finally tying the knot. However, the scene just had the reverend, the couple, Rory, Michel and Lane, which I feel like robbed us of the big town wedding that could have resonated with us for years to come. While I was never a big fan of season seven, the farewell party where the town said goodbye to Rory is one of my favorite scenes, it just brought together what made Gilmore Girls so special. I know that it was probably tough getting all the actors together, but I would have gladly substituted one of the big town scenes in the first or second episode for a large wedding scene. At the very least, Emily should have been at Lorelai’s wedding. Rory Gilmore was always a success. She went to Chilton, where she was valedictorian to getting into all of the colleges she applied to before settling on Yale. Even after she dropped out of Yale because her boyfriend’s father told her she didn’t have the chops to be a journalist, she became the most successful leader of the D.A.R. and then when she returned to Yale, she became the Editor of the Yale Daily News. Even when Rory Gilmore failed, it wasn’t for long. When we pick up on Rory’s life in A Year in the Life, she’s a floater, she has a couple of by-lines from a few notable publications, she has an online magazine chasing her, she is co-writing a book with an eccentric English woman, and she seems to have a finger in many pies but attempting to get a job at Conde Nast. However, as the year goes on, one by one her opportunities fall through. She goes for an interview at the online magazine but her blatant disregard for the job has her blowing the interview. The English woman (played by Alex Kingston) fires her when it is obvious Rory has zero interest in what she has to say. The Conde Nast interview keeps getting pushed back until it does not happen at all. She agrees to write an article for GQ about standing in lines, which she does research for but it does not culminate in anything. At the end of “Spring,” she moves back to Stars Hollow temporarily, and in “Summer,” she takes over as editor of the Stars Hollow Gazette where Jess comes to visit her and encourages her to write a book about her relationship with her mother. 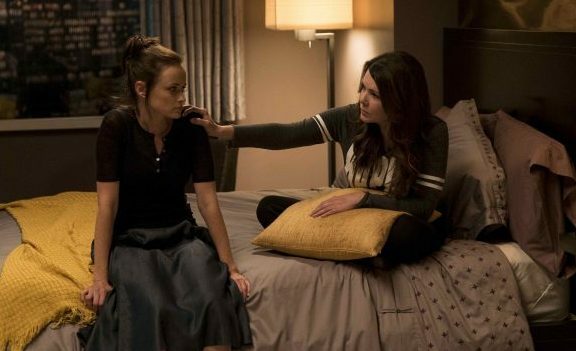 This originally causes conflict between Lorelai and Rory because Lorelai does not want her story out there for people to read, but she eventually comes around, only stating that she will not read it. So why did A Year in A Life show us all these career routes for Rory to take if she was just going to give up journalism as a whole? Why not give us short snippets of each of her jobs with the realization that this is not her passion? Or that her focus has changed? We did not need the lengthy scene of Lorelai and Rory interviewing the people in lines if Rory was not going to write that story. We did not need the few Alex Kingston scenes if Rory was not going to write that book. This could have been shortened into one or two montages, and they could have given us more Paris instead. Click next for our thoughts on Rory and her men. Caryn is a 26-year-old journalist from Cape Town, South Africa. She believes people will be more tolerable if they just watched more TV. Otherwise she's obsessed with movies, literally any book, comedy, Marvel, Harry Potter, and Halsey. Her dream is to one day marry Tom Hiddleston, or take over the world, whatever comes first. Previous ArticleTV Review: Once Upon a Time 6x09 "Changelings"